This is the point, in my opinion, having just missed this era and only remembering remnants of this abstract masterpiece, when the Times Square area looked the best. A cornucopia of neon trying to deny the night at the same time needing the darkness so the bright brash colors could stand out. So much of this is gone, the longer I look at it the sadder I get. As the city prepares to lose yet another what was a theater (the 1910 Columbia Theater), some of us are reminded of what once was. This vista was one of the multitude of reasons why people came to New York, to see this. I passed a brand new Pinkberry today on Broadway at 94th street. What had been there before, for as long as I can remember, was an antique store. Maybe antique is kind, maybe it was junk. The store was dusty, kept strange hours, smelled like cat (not in a good way) but the store and the storefront was unique. Now it is a Pinkberry, it looks like it was ripped out of a mall and dropped onto Broadway. That storefront no matter how small, was part of the mosaic that makes New York special. The Columbia Theater and the building it was built with are most certainly part of that mosaic. Most of us do not recall the the name Columbia being used as the name of this house. Very few of us remember the second or third name bestowed upon this house and for many years it was known as the Embassy 2, 3 and 4 (the theater known as just The Embassy, or Embassy 1, was on 7th Avenue between 47th and 46th streets). Names come and go, the Embassy moniker was re-applied to what had been a newsreel theater during World War II. The Columbia was renamed Mayfair in 1930, then the DeMille in 1960 and eventually it was Embassy(ed). The site in May of 1909. This looking at the north east corner of 47th and Seventh Avenue from the south west corner. This is on the same day but further down 7th Avenue at 46th Street. 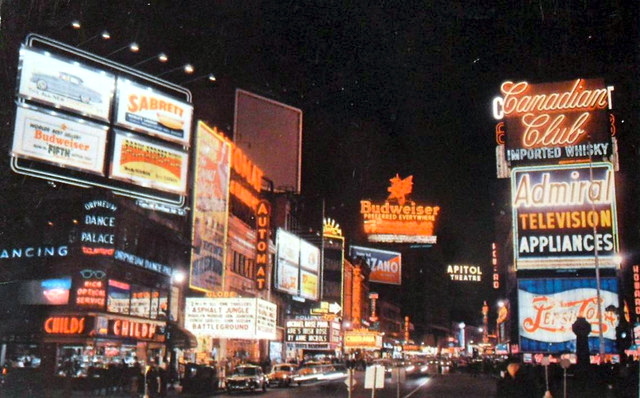 All of this will soon be gone and replaced by the Valhalla of Vaudeville - B.F. Keith's Palace Theater as well as the what will be known as the Embassy 1 and now the Times Square Visitor Center. 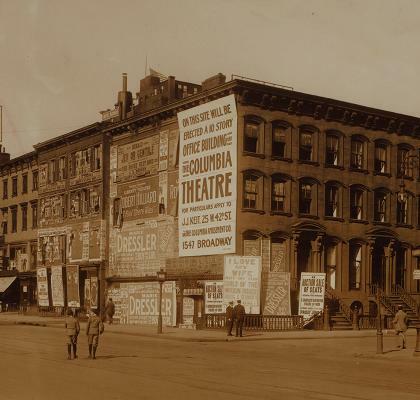 Originally opened on January 10th, 1910 as the Columbia Theatre at the northeast corner of 47th Street and Broadway inside an office building. The office building was home to the Columbia Amusement Company, one of the larger burlesque circuits. In 1910, the term burlesque had not grown into what it would become associated with. Instead the emphasis was on comedy, musical numbers and beautiful showgirls. The 1800 seat theater was designed by noted theatre architect William McElfatrick in a sort of Beaux Arts style. Above the proscenium arch, there had been a mural called “The Goddesses of the Arts,” painted by Arthur Thomas. The Columbia was also noted as one of the first theaters to install a ventilation system designed to remove tobacco smoke from the air. Although it wasn't airconditioned, at least you didn't leave smelling like a Chesterfield. The Columbia's Auditorium. The two balcony configuration was almost typical of McElfatrick's designs. “The Goddesses of the Arts,” by Arthur Thomas. Walter Reade bought the Columbia in 1928 and gutted it, leaving no trace of the original. 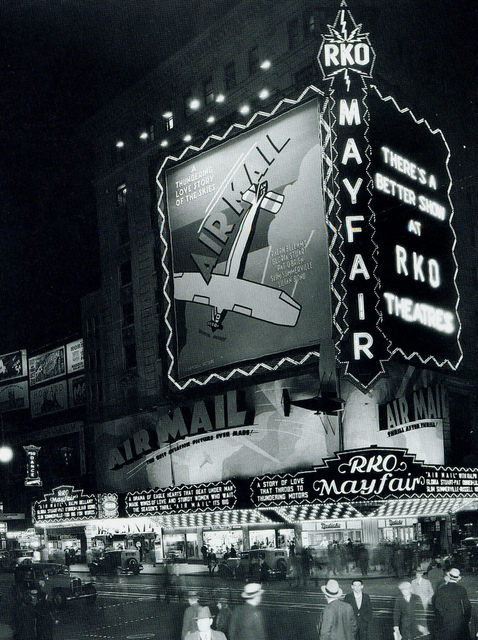 It reopened in October 1930 with a new name, the RKO Mayfair, movies only and movies with RKO as the studio of origin. The task of redesigning the space and turn the Columbia into a movie theater was left to my favorite architect Thomas W. Lamb. Lamb combined the two original balconies into a single balcony. The auditorium was done in an Art Deco style. Around the same time Lamb had designed one of the five "Loew's Wonder Theaters", now known as the United Palace but once upon a time went by the name "Loew's 175th Street". If the far east had ever underwent a period where the Baroque was blended with Art Deco, it would have looked like Loew's 175th. What you can see in this picture, the wall treatment, is not too slightly reminiscent of Lamb had created up at Loew's 175th. Eventually Loew's took over. Real air conditioning was added during the redesign. Well, the sign says the place was air conditioned, "always". In a pre - TV era, continuous shows from 8:30AM til 2:30AM for the entertainment starved. The Mayfair was owned by Brandt Theaters by 1955 when Night of the Hunter had it's New York premier there. 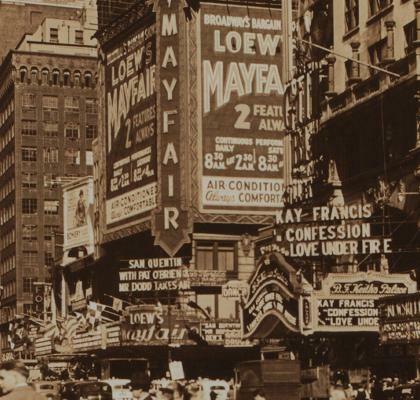 The name Mayfair was not to last and was ultimately changed to the DeMille Theatre, after Cecil B. (well he did play God's voice). Big world premieres of big pictures, when reserved-seat movies were popular in the early-1960’s included “Spartacus” (1960) “The Fall of the Roman Empire” (1964) and “Hawaii” (1966). 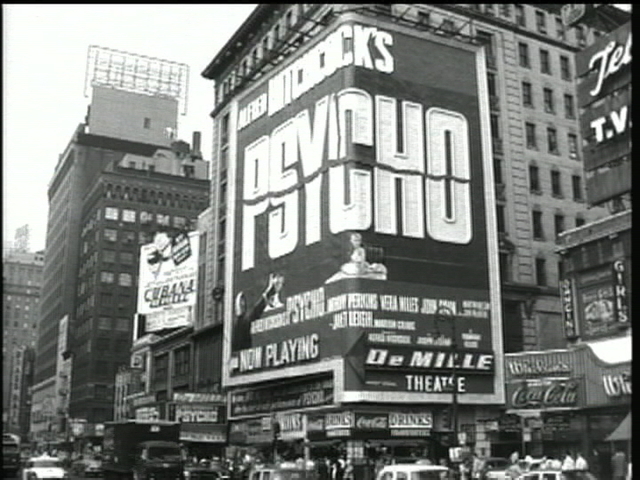 However, one of the most famous pictures ever made, Alfred Hitchcock's Psycho in June of 1960. It also had one of the most famous "No one will be admitted after the start of the picture" policy. This picture was taken by one of the nicest guys to ever put a picture on a blog, Ed Solero. When I first photographed the Hamilton Theater on 146th Street, it was Mr. Solero who helped put the pictures on the web. Always interesting and always helpful. 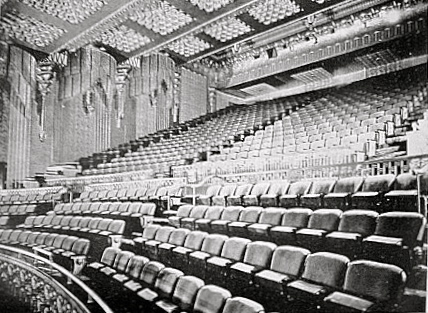 In late-1976, the theatre became the Mark I, II and III. The triplexing was crudely done by putting a wall dividing the balcony down the center, similar to the degradation of Loew's 83rd. It became the Embassy 2,3,4 Theatre in December 1977 when Guild Enterprises took it over. 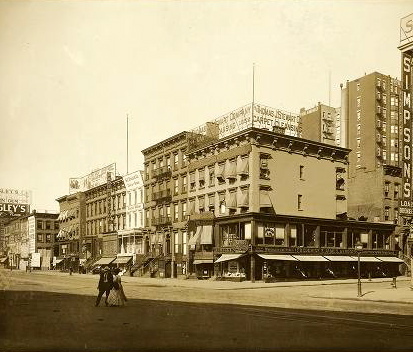 (The Embassy 1 Theatre was on Broadway at W. 46th Street, next to the Palace Theatre). 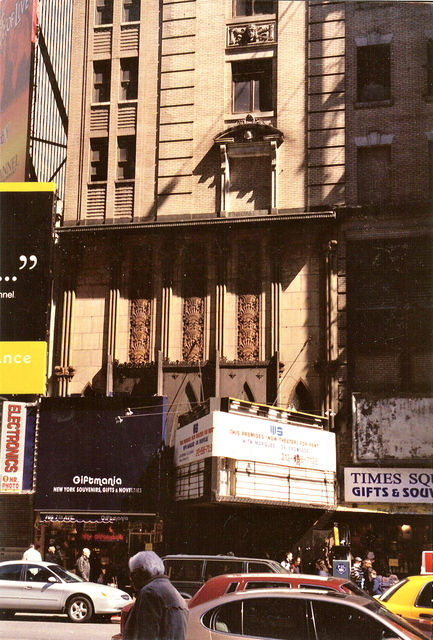 In 1997, after the Embassy 1 was closed for conversion into the Times Square Visitor Center, this theatre was renamed Embassy 1,2,3 Theatre. 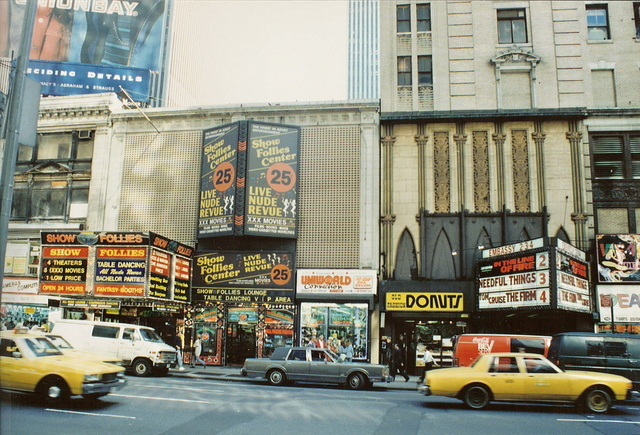 The Embassy 1,2,3 Theatre was one of the last Times Square movie houses to close. Another Ed Solero picture of the Embassy 2, 3 & 4. It was shuttered for several years and was a mega NYC souvenirs / t-shirt shop. Parts of the Mayfair's lobby ceiling was visible. There was a Famous Dave’s BBQ Restaurant in there at one point. The theater had been gutted again and by May 2013 every thing was out so demolition could begin. One more piece of the mosaic lost forever.